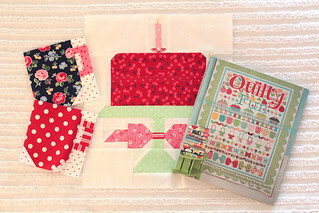 Happy Birthday Quilty Fun! You're an awesome book and I've enjoyed lingering over your pages and feasting on your pretty photographs. I love how you lay flat and stay open so that I can follow your instructions! And so many great projects! You're a great book Quilty Fun! Happy Birthday!! To celebrate Lori has designed a new cake block for us! It's super cute, with a candle and a fancy bow on the cake stand! It's fast and fun to make. Make some coffee mugs to go along with it and you're ready for a party! Congratulations to Lori and the Fat Quarter Shop on a great book! I hope you head over to the Jolly Jabber today to see who else is baking a cake for the party! It's a great list of people and I'm positive there are some delicious cakes just waiting! Cute! Maybe I can sneak a couple of hours and make this block! Absolutely adorable! 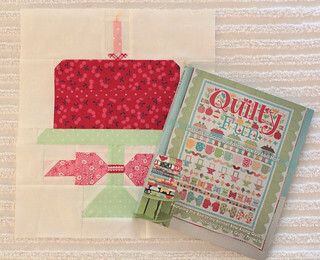 Quilty Fun is one of my most favorite books! I love this Pam! Red velvet on a jadite cake stand. You are a girl after my own heart!! Pam you are just so cute! I love your cake presentation and that video on instagram is darling. As cute as cute can be! Have fun at market, Pam!!!! Your fabrics are just so sweet and will be a BIG hit for sure! Miss Pam…you are too cute and so sweet! I'm loving your cake block and the cups! Wish we could celebrate together in person but this is the next best thing!!! Ah...red velvet? That's my fave! So cute! Great book. I had fun making the blocks from this book. Love the cake block, have to make it. #PamSewCute! You should be a hashtag! I'd come to your cake making party anytime. Thanks for sharing. I'm gonna pretend that it's cherry cheesecake because... yum. And I love your PKM coffee cups too! So cute!! Love your idea, coffee with chocolate cake is the best!! So cute! And I love the vintage cake stand!!!!!! And of course yours wins. 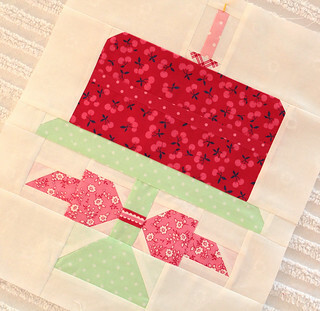 I just commented how delectable Happy Little Cottage's cake looked in PKM fabric, and here is yours! Scrumptious! I love the coffee mugs you've made to go with cake.